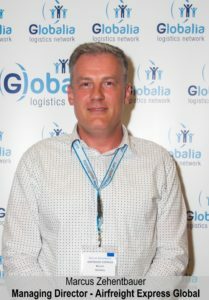 Last week we interviewed Mr. Zehentbauer, Managing Director of Airfreight Express Global GMBH, Globalia member in Munich, Germany, who tells us about his company, his experiences in the industry and much more. Q. Can you tell us a little about the history of Airfreight? A. Our company was founded back in May 2007 by three shareholders. Our objective was to provide customized logistics services at a very reasonable pricing and for more than a decade, we have managed to do the same with utmost dedication. Q. What distinguishes Airfreight from other freight forwarders in your city? A. Airfreight Global is a medium sized company which comes with a solid global presence. One of the most distinguishing factors about our team is that we offer tailor-made services 24/7 which meet all the requirements of our customers and are available at a rock bottom price. Q. What has been your greatest success so far? A. Our greatest success has been to survive the stiff competition in all these years while working right from day one without any credit from any bank in the world! Q. Which is the most difficult shipment your team had to deliver? How did you handle it? A. In 2008, we handled a missile warhead which was transported from Germany via Amsterdam to Tehran. This had been one of the most remarkable as well as challenging shipments moved by our team. Q. How did you hear about Globalia? A. I received a mailer from Globalia and that is how I first heard about your network. When we saw that Globalia allows only one member per city, we immediately decided to join. The exclusivity of members is one of the major reasons which prompted us to join this network. Q. What do you think are the benefits of attending our Annual Meetings? A. Talking to our network partners and discussing a business deal over phone or emails are never enough. Meeting the network members face to face is one of the most important advantages of attending the Annual Meetings. The Annual Meetings give us the much needed personal touch which is so important for building a constructive business relationship. Q. What are the main technological challenges facing freight forwarders at the moment? How important is technology for the industry? A. E-commerce, e-AWB, 4PL, and specialized logistics software are now an integral component of the supply chain industry. The multinationals are making the best use of technology and in order to survive the competition we constantly need to innovate, improve and keep pace with the technological advancements. Otherwise, we will lose out at the end of the day. Q. What are the advantages of operating from Germany? Are there any challenges facing your country at this moment? A. The strong economic situation in Germany is one of our major advantages but, at the same time, maintaining this high level is also of one of our challenges. Additionally, dealing with Brexit and figuring out the economic consequences is going to be a rather challenging task. Q. From your own experience, which are the keys to success in the freight forwarding industry? A. One needs to be sensitive about the needs of the clients. A freight forwarder needs to feel the problems faced by the customers and come up with an ideal solution. This can be the basis of a long lasting relationship with your customers. Q. Tell us a funny story or an anecdote about a curious shipment you have handled? A. I can remember one funny story which was really annoying for our client. We were waiting at Munich for a big shipment which was supposed to be sent from London. Even after 3 attempts, the shipment was not loaded into the airplane and we didn’t know what to do next. However, we finally laid our hands on the shipment which was sent as a general cargo shipment within just 2 hours! Q. Where do you see your company in 10 years? A. We have come a long way in the last 10 years. In another 10 years, we want to see ourselves as one of the most competent logistics service providers in Germany. Globalia members with shipments to/from Munich, Germany, are invited to get in touch with their professional team.